Anyone under 60 would probably ask, who's band? 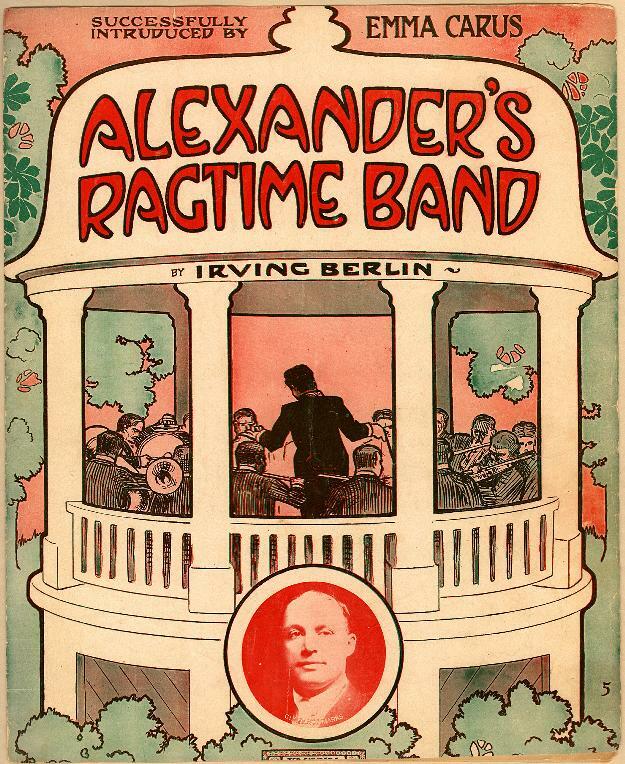 However,"Alexander's Ragtime Band" is the name of a song by Irving Berlin. It was his first major hit, in 1911. There is some evidence, although inconclusive, that Berlin borrowed the melody from a draft composition submitted by Scott Joplin that had been submitted to a publisher. 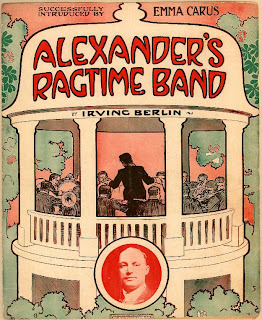 Alexander's Ragtime Band" is not itself an example of the ragtime musical idiom; apart from some mild syncopation, it has almost none of ragtime's characteristic features. Nonetheless, the lyrics clearly refer to the arrival of African-American musicians on the popular scene with their then-new idea of playing standard songs in a more exciting up-tempo style. Vaudeville singer Emma Carus, famed for her "female baritone", is said to have been largely responsible for successfully introducing the song in Chicago and helping contribute to its immense popularity. It became identified with her, and soon worked its way back to New York where Al Jolson also began to perform it. The song was reportedly one of the songs played by the band on the sinking Titanic in 1912. Reportedly it was played early on in the sinking of the ship. The song has been recorded by many artists, including The Andrews Sisters, Louis Armstrong, Ray Charles, Bee Gees, Bing Crosby, Ella Fitzgerald, George Formby, Al Jolson, Liberace, Billy Murray, Liza Minnelli, Bessie Smith and Julie Andrews. -Four different versions of the tune charted at # 1, # 2, # 3 and # 4 in 1911 including one by Arthur Collins which stayed at number one for 10 weeks. -Bessie Smith's version made the top 20 in 1927. -Louis Armstrong made the top 20 with it in 1937. -A duet by Bing Crosby and Connee Boswell hit #1 in 1938. -Johnny Mercer charted a swing version in 1945. -Bing Crosby recorded another duet version, and hit the top-20 in 1947 with Al Jolson. -Nellie Lutcher put it on the R&B charts in 1948. -Bob Wills put it on the c&w charts in the same decade. -Johnnie Ray sang it on the silver screen in 20th Century Fox's musical There's No Business Like Show Business in 1954. -Ella Fitzgerald scored with it in 1958, and received a Grammy for her Irving Berlin anthology in 1959. -Ray Charles recorded it in 1959 for his album The Genius of Ray Charles. -Bee Gees used the music in their tour in 1974, and sang it on The Midnight Special TV show in 1973. -A 1938 film of the same name was loosely based on the song. -A version of the song set to a disco beat was recorded by Ethel Merman for her infamous Ethel Merman Disco Album in 1979. -A snippet of the chorus of "Alexander's Ragtime Band" can be heard toward the end of Taco's 1982 cover of "Puttin' on the Ritz", a number 4 hit in the United States.